Host China has representative in all five disciplines. Who can spoil the party of preventing them having a clean sweep for the first time at their home ground Superseries? The world ranking discrepancy is very huge between these two finalists but Chinese women’s doubles are known for their high quality skill. Tang/Yu combination are good prospects to be permanent pair. They won the Bitburger Open Grand Prix Gold couple of weeks ago and delivered the crucial point at the Sudirman Cup semifinals in May this year. Yu Yang is defending champion, partnered with Wang Xiaoli. It is the third Superseries final for world number one Matsutomo/Takahashi as they topped podium in New Delhi and runner-up in Singapore – they are the title holders for the upcoming Dubai Finals. Fischer/Pedersen are the biggest challenges for the incredible Zhang/Zhao as they booked victory in their last four meetings including Japan Open final this year. Home favourite has collected five titles so far in the top level tournaments this year and their opponent won two titles in Tokyo and Malaysia Masters Grand Prix Gold. The Chinese aces were a little sluggish in both second round and quarterfinals against Lee/Lee and Jordan/Susanto respectively while the Danish duo were pretty sharp in overcoming their opponents. It will be close contest with an unpredictable outcome tomorrow. A limping head to head statistics as the reigning Olympic Champion won 9 of 11 times of their meeting. Saina Nehwal had found it tough in the early rounds to eliminate Sun Yu and Tee Jing Yi then had relatively comfortable wins to clear the next rounds. Winning the Denmark Premier crown last month has boosted Li Xuerui’s morale to try and reclaim her former authority on the world circuit. Former champion Li has had a smooth run to book her final ticket at home soil with all straight-sets winning over her rivals. Lee Chong Wei exhibited superb fighting spirit and a brilliant display to down his arch rival Lin Dan on China soil despite trailing behind in both the second and deciding games. His final hurdle none but home hero Chen Long who looks in good shape here, considering his performance to subdue tough and tricky opponents like Viktor Axelsen and Son Wan Ho. 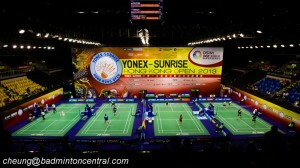 The Malaysian star battled hard against Chou Tien Chen, Jan O Jorgensen and then took 92 minutes to defeat Lin Dan. He must prepare to have a better strategy to face Chen Long. Huge pressure is on for Chen to bring the men’s singles crown back to China after failing last year. Maybe it’s right time for a home men’s doubles pair to pocket first ever title at the home ground Superseries and Chai/Hong have bright opportunity to redeem their previous year’s loss. The unseeded Kim/Kim played beyond expectation here to knock out three seeded pairs en route to the final; 8th seed Lee/Tsai, 4th seed Boe/Mogensen and 5th seed Endo/Hayakawa. They reach the finals in back to back tournaments after winning the Korea Grand Prix Gold in Jeonju last week. Many unexpected results happen in this category as two frontrunners, Lee/Yoo and Ahsan/Setiawan were sent packing early.